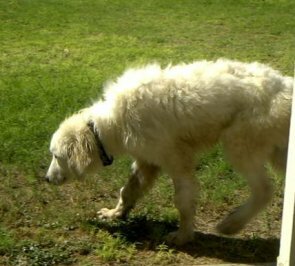 The National Anatolian Shepherd Rescue Network (NASRN) learned of a litter of five Anatolian Shepherd/Great Pyrenees mix puppies in western Texas whose owner was unable to care for them. The rescue coordinator located a willing foster home in El Paso and went to work arranging transportation. It took a while to set up the transport as the distance was not short. By the time NASRN took custody of the puppies there were only four. The owner indicated that the other pup had been promised to someone. We do not know how he has fared. The four remaining puppies, all males, were transported to El Paso. One of the puppies was already very sick and could not stand up. The other three soon became ill as well. They had all contracted parvo. 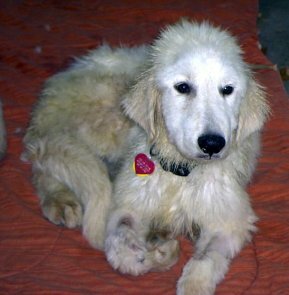 The puppies needed many days of intensive veterinary care, but they all seemed to recover. They were moved to Granbury, Texas, southwest of the Dallas-Fort Worth area, to gain weight and strength. They all seemed to do well after their second long ride, but one puppy, Polar Bear, soon started to show signs that he was not well. His appetite decreased and he became lethargic. His new foster mom was watching him closely and was ready to take him back to the vet, but he passed away during the night sleeping next to her. 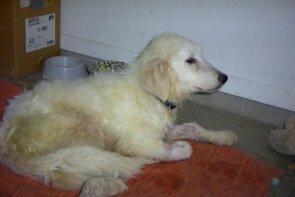 The vet believes that his heart had been damaged by the parvo and he was unable to fully recover. I followed the story of these puppies from the beginning through the NASRN rescue coordinator, and although I have not seen these dogs I feel attached to them. I take some comfort in knowing that before his death Polar Bear found that many people cared about him and treated him with love. I am also pleased that two of his brothers are doing well. You can read about them here or on their individual pages here and here. Unfortunately one of his brothers fell ill and did not make it. You can read about him here. Polar Bear was the fuzziest of the four boys. He loved attention and was a gentle dog. He liked having his ears scratched. Polar Bear enjoyed singing (howling) and resting on his favorite blanket. He did not have much time here, and spent most of it without the attention he needed. Before he had to leave he found love and comfort, and that is what he took with him. If you would like to contribute toward ensuring that the next dog like Polar Bear that needs help will be able to find it, you can email NASRN here. All pictures and text are copyright © J. Brandy Gardes or Charles Helm 2003-2007 and may not be used or reproduced without written permission.